Do The Odonata With Me! Did you ever notice those large insects zipping over streams and ponds all summer long, skimming the water, then shooting about in zigzag patterns that make your head spin watching them? Dragonflies and damselflies, collectively belonging to the taxonomic order Odonata, are named for their prominent biting mouthparts and predatory nature. Not to worry ­ they don't bite or sting people! Amazing is the fact that there are more species of dragonflies in Sussex County, New Jersey (145, out of a possible 182 in NJ) than any other county in the United States. 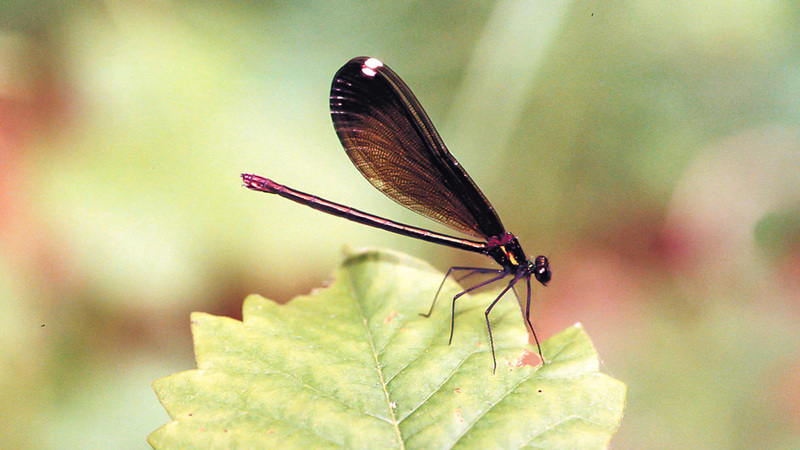 A large, iridescent, broadwing damselfly with black wings, ebony jewelwing is a common sight flitting around small streams as summer approaches. Damselfly forewings and hindwings are similar in shape and held either pressed above the body or are only partially open at rest. Dragonflies, by definition, are stout and large bodied with round heads and eyes covering much of the top and sides of the head. The forewings and hind wings are different shapes and are held straight out to the sides while resting. They are strong fliers. Damselflies, on the other hand, are more delicate and small bodied. Their abdomens are narrow, their heads are wider than long and the eyes are separated by more than their own width. Distinctive from dragonflies, damselfly forewings and hindwings are similar in shape and held either pressed above the body or are only partially open at rest. For the most part, they are much weaker fliers. 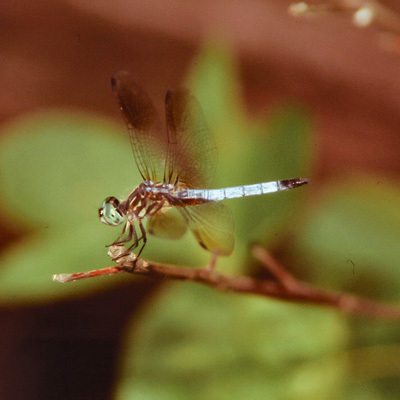 In New Jersey, the season for dragonflies and damselflies runs from April through October, although the best month for spotting the most species would be June. This coincides with the increasing photoperiod (length of daylight) and moderating temperatures. 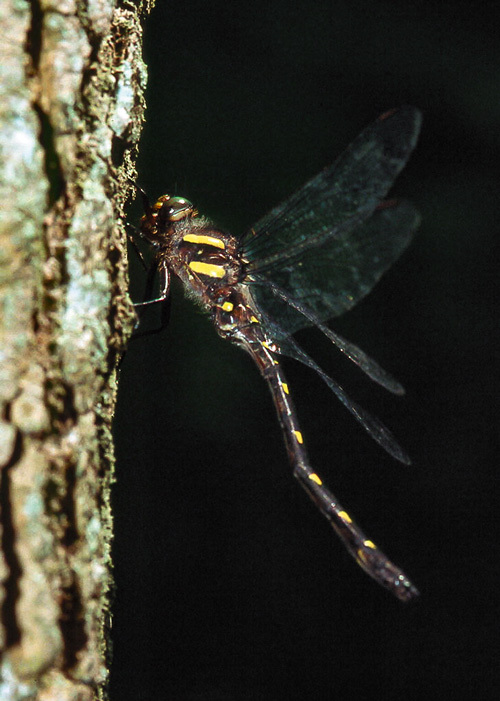 Large and black or dark brown, with a double row of bright yellow spots on the top of the abdomen and bold yellow stripes on the thorax, the twin spotted spiketail is commonly found patrolling long distances along New Jersey’s forested streams and rivers. These miniature predators actually start their life span as larvae and may spend one or more years under water! Once they surface, they go through a molt in the morning hours that leaves them vulnerable to other predators. Later in the day, their body parts and wings are dry, and they're ready to start their adult flying life. As adults, their life cycle is anywhere from several weeks to months. Food preferences range from insects, mosquitoes, butterflies and other dragonflies ­ they are non-discriminatory on this point. Preparing for the next generation, the adults will lay their eggs on or in plant stems located in ponds and streams, or sometimes in the sediment. The best places to find dragonflies and damselflies are usually in clear, clean water; like a swiftly moving stream, a pond or lake. However, forested areas with associated stream complexes may offer up a smaller percentage of species. Another good location to watch them is in farm fields and open areas that have an abundance of insects. Skimmers are the most common and colorful dragonflies with two pairs of large gossamer wings extended outward from the body when at rest. 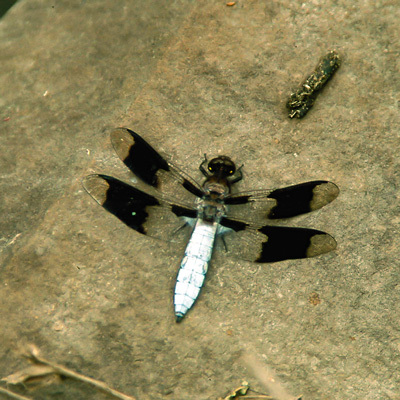 Above: Widow skimmer. So who is looking at dragonflies and damselflies? It appears that this is the "new birding". Many tried and true birders, in their quest for knowledge and new things to look at while enjoying the outdoors, have included butterflies and dragonflies on their "to do" list. Tom Halliwell, past president of the New Jersey chapter of NABA (North American Butterfly Association), became intrigued with dragonflies about five years ago after meeting and sharing lots of field time with odonate expert Allen Barlow. A long time birder turned butterflier, Tom became fascinated with these colorful, quick moving fliers. They presented "a new challenge" he says. "It seemed like a natural progression since I enjoy all aspects of the natural world. Their predatory behavior is extremely interesting." Other birders-turned-dragonfliers include George Nixon, who, under Tom's expertise, has become a serious student of Odonata. He has formed a group, JOE (for Jersey Odonate Enthusiasts) whose sole purpose is to conduct field trips in New Jersey to seek out all species of dragons and damsels. A major activity for JOE will be to conduct surveys within the Delaware Water Gap National Recreation Area and various NJ Nature Conservancy preserves. For educational material with species descriptions and photographs, flight periods and checklists, as well as upcoming field trips (in season) check their website. 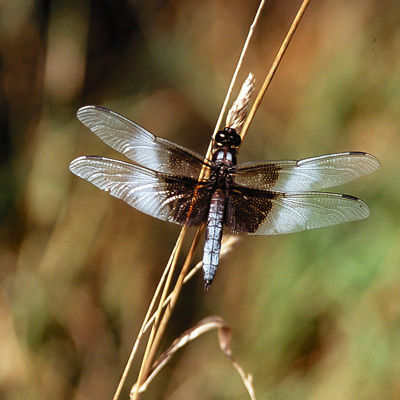 Now that you're intrigued, how do you get started identifying dragonflies? Close focus binoculars are the first piece of equipment necessary. They should preferably focus down to 5 to 7 feet. A digital camera with close focus capability helps when referring back to species seen that day in the field. Next, a 10x loupe or magnifying glass is helpful in making distinctions between closely related species. 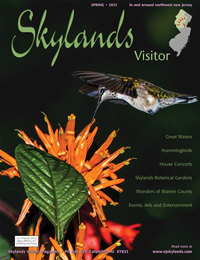 There are now many field guides available, including the Stokes Guide to Dragonflies and Damselfies, Damselflies of the Northeast by Ed Lam and the Field Guide to Dragonflies and Damselflies of Massachusetts by Nikula, Loose and Burne (applicable for NJ) and Dragonflies Through Binoculars by Sid Dunkle.